Fall Quilt Market 2010 Re-cap #4 (and massive give-away #4!) - Stop staring and start sewing! I know this is taking forever but I have one more re-cap after this (and the big prize) the regular programming will resume. Whew! I've been busy with home stuff but it's been fun to notice my patterns showing up at a bunch of new stores since Quilt Market (I'll update the sidebar soon). 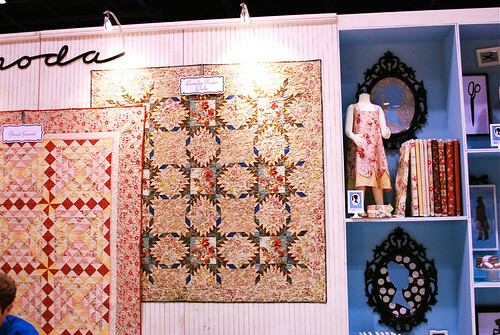 I was tickled pink to see my designs on display in the main Moda booth (really an honor!). 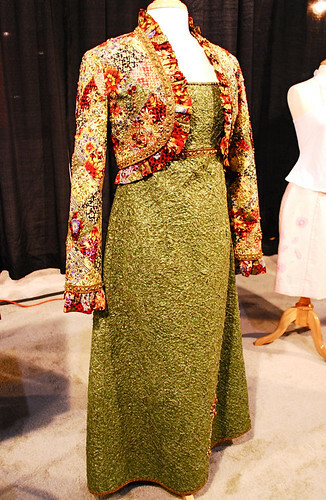 Here is my Sunny Scallop Dress made from the new French General fabric that is coming in the spring. Now here's a little secret....the dress is on the manniquin backwards but I was so excited to see it up there I just kept my mouth shut. :) I think it looks really pretty. Here is my Evelyn Apron Skirt made from Aneela Hoey's up coming Sherbet Pip collection (great fabric collection and a lot of buzzing about it). 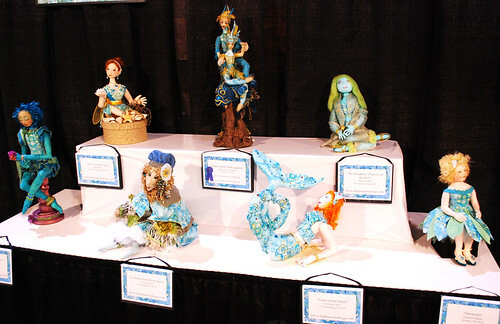 And I was once again thrilled when I saw my pattern covers on display in the Tri State Printing booth. Yay! Okay, enough about me (really...I mean it....stop! 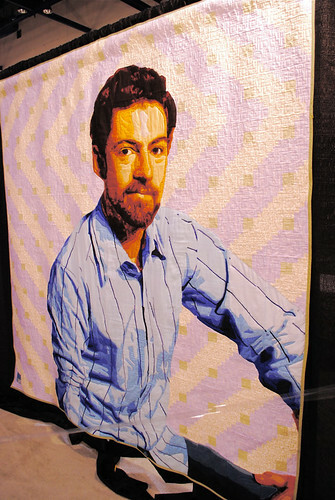 )...and onto some gorgeous quilts. 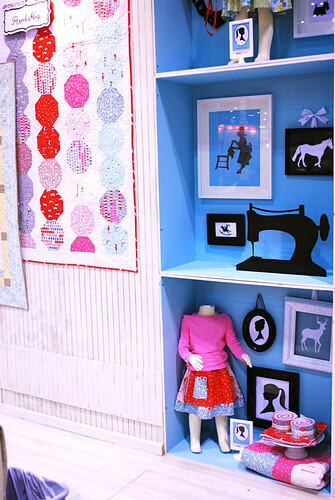 I love the area where the quilts are on display at market. It's a nice serene room and a good place to take your shoes off and walk your sore feet on some soft carpet. 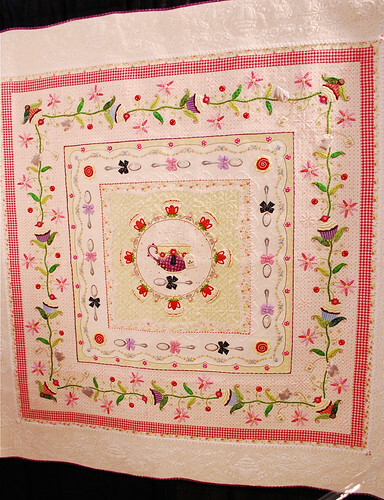 Not all of the quilt can be photographed due to copyright reasons (yes, the copycats are out there) but there are enough great things in the "okay to photograph" area to catch anyone's eye. If you want to see more detail, just click on the pictures and you can see them bigger on flickr. This one is called Tropical Apple and it was made by Caroline Mounier-Vehier with the help of Edith Frey. Isn't it crazy and fun? I wonder where she will keep it when it's done travelling to shows. Wouldn't it be a great conversation piece sitting in the corner of the family rooom (under a spot light of course)? 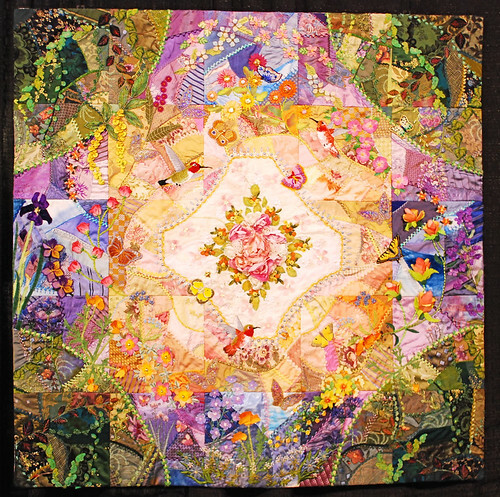 This is called My Big Wide World by Ruth de Vos. Wow! Here is Crazy in the Garden by Allison Aller. It's covered with butterflies and humming birds and all sorts of garden friends. So beautiful. I LOVE this one! 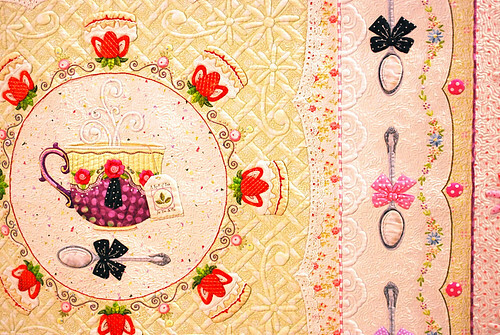 It's Tea with Miss D. by Sandra Leichner and it's just exquisite and cute at the same time. Here is a close up so you can see some more details. 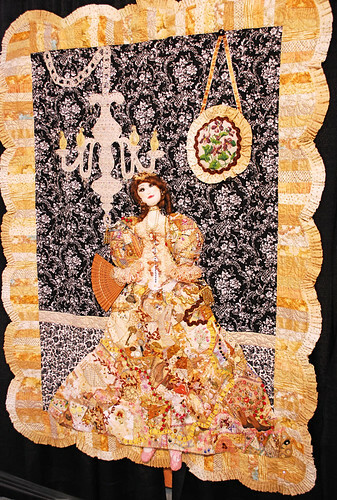 Look at the quilting work! The appliques! Oh my. This one is Longe Road Home by Peggy Parrot (I like her name!). 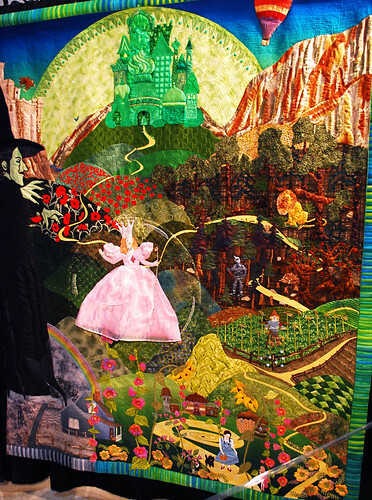 This quilt nearly glowed with all the gold and emerald colors contrasting against each other (and Toto too!). Queen Bling by Traci Newburn. I love all the ruffles and scallops. And that chandelier! 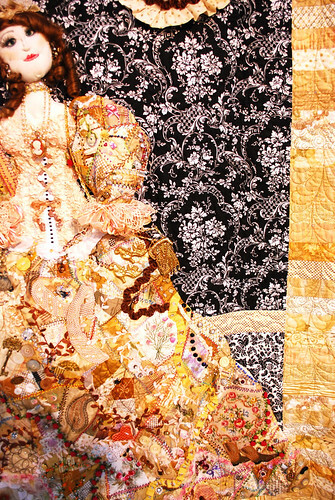 Here's a close up of some of the crazy quilt details of her dress. So much work and talent went into this! 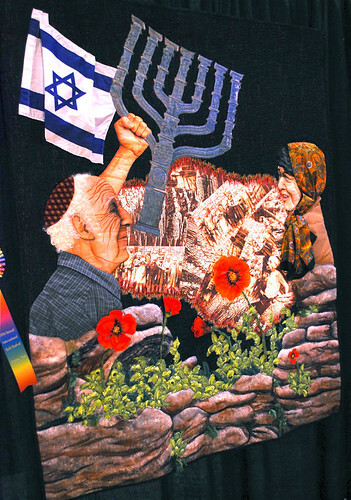 This was a beautiful and moving quilt called Out of the Ruins, a Nation Thrives by Phyllis Binkley. Look at the wrinkles on his face and the colors on those rocks. This is a self portrait by Luke Haynes and it was simply amazing. It was for sale (no price listed, I'm curious too) but I knew I'd have a hard time explaining the new bedspread to Joey. Now, if he had made a quilt with Ty Pennington on it I'd be in there bidding alright (I'd worry about the explanation later). I really love the quilted clothing (something I can really get behind). 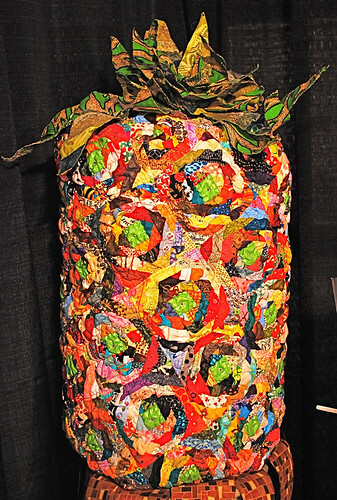 This is "Maximum Impact" by Kathy Knapp and it is beautiful to look at as well as something I could imagine actually wearing. 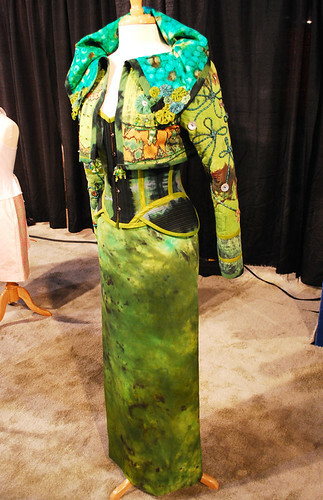 Here is "Requiem Verde" by Gilbert Muniz. Incredible. 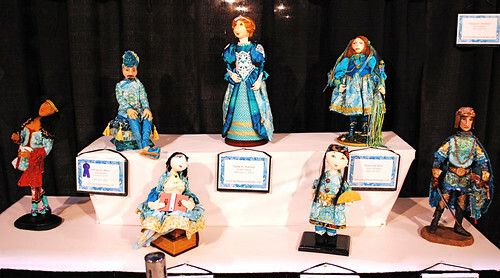 The dolls are always fun too. So whimsical and elfish looking (or is it elvish?). Okay, another give away (The winner of the last give away is Jenifleur. Contratulations Jenifleur!)! 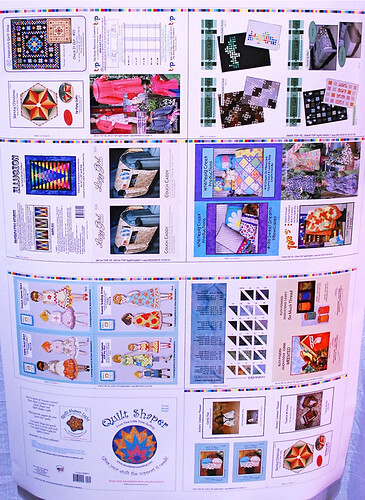 Give away #4 is a wonderful book by Annie Smith called The Ultimate Applique Guidebook and it is properly titled because it's a great resource book to have with lots of lessons and patterns (and it's signed especially for my readers!). 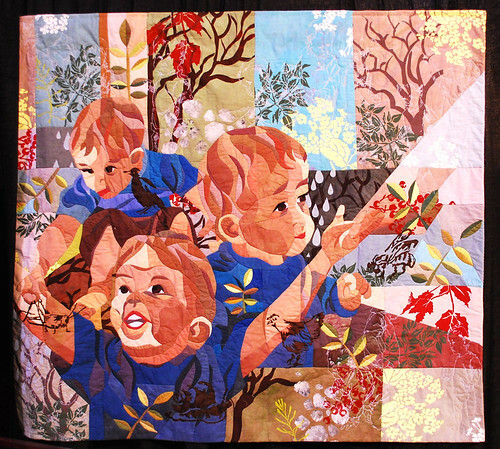 I'm also giving another beautiful pattern by Amy Butler as well as Sweet Ruby's Cooper's Cars quilt (seriously cute). And of course 4 more stacks of the 2.5 inch square from Moda (I love these things!). 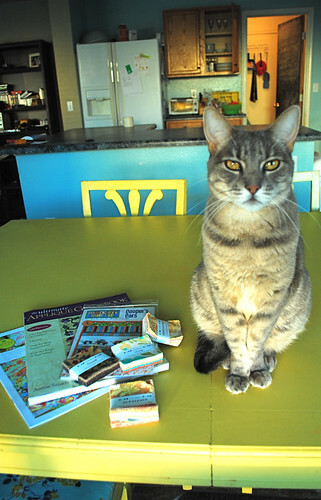 This is a terrific give away and we have put the guard cat on duty to keep it safe. You can tell by her expression that Schnelly will not tolerate any messing around with this stack of goodies. So leave a comment and keep on sewing (Christmas is coming but I won't tell how many days since I don't want to start a panic).